If your future includes a move to Westlake Village, check out Meathead Movers! Our professionally trained student-athlete movers, moving concierge, and princess packers are prepared to get you safely moved into your new Westlake Village home. When you make your move to Westlake Village, be sure to contact Meathead Movers. No matter what type of moving service you need, our student-athlete movers are ready to handle all your moving needs. If you’re fortunate enough to count yourself among the residents of bucolic Westlake Village, you are a person who appreciates and deserves the very best. When it comes to moving day, we are your very best choice of Westlake Movers. Our student-athletes movers, who attend local schools such as Pepperdine, Moorpark and Whittier Colleges, are professional, courteous, and respectful. They’ll make your moving day a stress-free, pleasurable experience. Living in Westlake Village is the best of both worlds; it’s a peaceful and quiet area, yet it’s just a few dozen miles from Los Angeles, one of the busiest places on the planet. This is a planned community, conceived and built in the 1960s as an enclave and respite for those who spend their days in the hustle and bustle of LA. And yes, there is a lake in Westlake Village. Westlake Lake is a man-made body of water. At its center is Westlake Island, an exclusive, gated community of around 320 homes. The island is bisected by Los Angeles and Ventura Counties, and the bridge that connects it to the mainland is called “La Venta” in homage to the two counties. 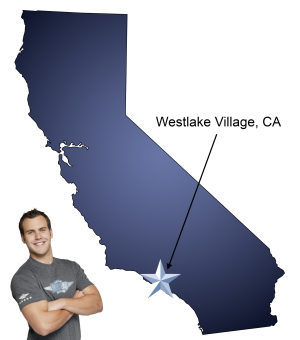 If you are considering a move to Westlake Village Village, Meathead Movers is here to help. Our moving company specializes in local, long-distance, and commercial moves to, from, and within Westlake Village. We also provide reliable packing, storage, on-site relocations, and our distinctive moving concierge service which connects you with local service providers. All our student-athlete movers are thoroughly screened and trained before their first move. With branches not just in Westlake Village, but all throughout California, we are your one-stop resource for all your moving needs, no matter where your California move takes you. In fact, you can see what your neighbors in Westlake have to say about us. With our 100% satisfaction guarantee, the only thing you have to lose is the stress that comes from moving! So contact us today for a free no-obligation moving quote and to learn how we can help you on your next move! Moving to Westlake Village? Here are some helpful resources. View more Westlake Village resources. I have moved many times in my life - from a number of short moves with minimal belongings in an apartment to more stuff in a small home to a larger one and eventually to a 4,000 square foot home in the Boston area. The contents of that home were packed up and moved cross country, stored for 3 months and finally successfully deposited in our new Thousand Oaks home. I have obviously had a good deal of experience with moving companies. I can unequivocally say you are one of the two best ones I have ever had. (The other is a Boston based outfit called "Gentle Giant", a highly respected company.) You guys are the greatest!! Having a move coordinator to discuss all unique aspects of our move in detail and offer useful suggestions has been wonderful. We had an incredibly complex move, and Chris made notes of everything in a very useful way and the move went very smoothly. Everything he promised happened within the costs he quoted. I can't imagine having done this move without Meathead Movers and Princess Packers. And they did it at a great savings over what the more old fashioned, long establish companies quoted me for the same thing. Great system to quote jobs. Friendly, personalized, flexible. Everybody has been just terrific and worked so hard for us. We really appreciate the fine service and great attitudes from all the lovely young people we interacted with, whether we just spoke on the phone or met face to face, they were all outstanding. We wish everyone everything good in life and with their future career paths that they choose. With their good work ethics already, they should all go far and have much success. Good service. Good attitudes. Hard working young people. Everybody works hard and are very professional. Couldn’t be more pleased.